America should never negotiate with the Palestinian Authority- which has aligned itself with Hamas. Palestine is a region, not a people or a modern state. Based upon Roman Emperor Hadrian’s declaration in 73 AD, the original Palestinian people are the Jewish people. West’s whole response is fantastic. Wish he were the GOP nominee for Prez. “Today’s endorsement by President Barack Obama of the creation of a Hamas-led Palestinian state based on the pre-1967 borders, signals the most egregious foreign policy decision his administration has made to date, and could be the beginning of the end as we know it for the Jewish state. From the moment the modern day state of Israel declared statehood in 1948, to the end of the 1967 Six Day War, Jews were forbidden access to their holiest site, the Western Wall in Jerusalem’s Old City, controlled by Jordan’s Arab army. The pre-1967 borders endorsed by President Obama would deny millions of the world’s Jews access to their holiest site and force Israel to return the strategically important Golan Heights to Syria, a known state-sponsor of terrorism. Resorting to the pre-1967 borders would mean a full withdrawal by the Israelis from the West Bank and the Jewish neighborhoods of East Jerusalem. Make no mistake, there has always been a Nation of Israel and Jerusalem has been and must always be recognized as its rightful capital. In short, the Hamas-run Palestinian state envisioned by President Obama would be devastating to Israel and the world’s 13.3 million Jews. It would be a Pavlovian style reward to a declared Islamic terrorist organization, and an unacceptable policy initiative. It’s time for the American people to stand by our strongest ally, the Jewish State of Israel, and reject this foreign policy blunder of epic proportions. Wish this guy was President right now. He’s the man America and the West desperately need. How will we ever convince this man to run for President? He is our modern day George Washington. Washington didn’t want to be president either…but was convinced his country needed him. WE NEED WEST IN THE WHITE HOUSE! 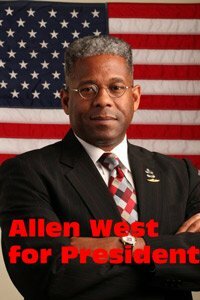 Allen West has stated that the only way that he will even consider running for President is if his constituents in Congressional District 22 of Florida will relieve him of his duties to run. He of course wants to consult with his wife and two daughters as well as feel it from G-d that it is the right time. There is a very strong movement to get him to run for President as a Republican but whether or not the Republican Party will allow it is another story. I think they will when they realize that he is the ONLY person who can be obama (I refuse to capitalize his name) the hateful clown who has disgraced this country and the White House. Check out http://www.AllenWestNation.com and join. It is your kids future and the future of the free world as far as I am concerned. Absolutely-there’s already a wing at the white house with his name on it! We NEED him. He’s amazing! We know West has the balls to back up his words. Actually Hadrian was Emperor from 116-138 ce. And he created the province after the second Great revolt of bar Kochba in 134 ce. jews have to increase the pressure on the government of israel to TELL THE TRUTH to the world media that ISRAEL is the land of the JEWISH people and NOONE ELSE. THERE IS ONLY ONE RELIGION IN THE WORLD AND IT IS JUDAISM, USURPERS NEED NOT APPLY. Not to worry, my friends. Israel has “the bomb”, and the Jews are God’s earthly people. Damascus will soon be in rubble. The odds are against us, but we are told God will bless those who bless Israel, and curse those who are against. But Allen West could make a difference. Obama has misinterpreted the Iran-led Arab uprisings; and has uncritically adopted Arab propaganda. Obama’s latest declaration is so divorced from reality that one has to ask: What is this really about? Is it soft talk for a strong response to the Iran-Syria alliance? I hope so, but strongly doubt it. Jared, Obama and his handlers absolutely know what he is doing. Make no mistake, the Council on Foreign Relations is in control. New World Order. +++Nothing+++ happens without a reason. Hey, Tyrell, get back to moveon.org or under the rock from which you slithered. what would you expect from someone named “tyrell” ? you have no clue what you are talking about, Congressman Allen West can back up his words. You need to go back and ask bumma for a refund for the comments you made. Wow… that was a racist comment ! Wow, this guy is awesome! Stick that where the sun don’t shine Obama! Obama has just betrayed our American heritage to defend Israel to the last man… Obama the Judas president, says it plain enough. Obama is brainless as is Tyrell! Obama is doing what he ran for office to do, lift up his muslim brothers at the expense of America and Isreal. Why do we need to send a dime in aid to oil rich nations? @Tyrell; Pathetic, just because an educated African American is able to stand with best of our politicians doesn’t make him a so-called “Uncle Tom” a term I absolutly abhor, please check yourself. Al…..I hope you do not take everything on Wiki as factual, you do realize it can be edited and depending on the whim of the person doing the editing “facts” have a habit of disappearing……..
Everyone needs to take 5 mins and e mail the white house or place the call. We are about to lose our best ally in the middle east. You can bet if Bin Laden had been in Israel he would not have lived there 5 years in peace. Make the call. Jews need to wake up before the next election. Dont trust Obama, he is a muslim at heart and making the downfall of israel and the u.s. easy for them. although ”Barrack Obama” mis-interpretd his speech. But i still believe he is d best we need 4now!!! So Al, how do you account for Obama claiming he’d visited all “57 states” while campaigning in ’08? Shouldn’t he know how many states we have here – even without Wikipedia? When I think “57” I think “Heinz 57 Varieties” or the 57 member states (counting the PA) of the Organization of the Islamic Conference. One is left curious about the source of Obama’s “slip”. Yes, West got the “Palestina” reference wrong. I can forgive him because he got the essentials right. Obama continues to get the essentials wrong. You jews and non-jews alike are wasting your time using logic to shoot down Obama’s position. He’s running for President of the world, now. He’s not worried about Americans anymore. I would be careful in jumping from one black president to another when he does not stick to the main one issue. F–k it! if and when other issues are included. Do not follow too close behind, then you may not like what you smell. Paste it if you want to or not, I will not be offended. Sorry, I do not think a white leftist would be better than Mr. West. Please spare us the racialist stuff. Obama’s wants all the muslims to attack Israel now. That’s what this is. Doesn’t anybody realize that? 1. Is Obama’s position on Israel significantly different from that of George H. W. Bush and George W. Bush? The fact that so many Israel supporters are convinced otherwise is a source of frustration. Like Bill and Hillary Clinton, Obama is merely free to take a harder line on Israel than was George W. Bush because he doesn’t have conservative Zionists (who aren’t going to vote for him anyway) in his base. This is important, because it means that whoever replaces Obama won’t be any better for Israel, or at least not any better for Israel than Bush was. 2. Allen West’s appeal to religious and historic Zionism may excite the base, but it falls on deaf ears to A) people who do not possess Zionist-inclined religious beliefs and B) people who may certainly assent to the Jews’ historic claim on the land, but in the modern context find it to be as relevant as the same of the Cherokees, Sioux, Australian aborigines, or for that matter the folks who just had a piece of their land stolen by Muslim usurpers in order to form Kosovo (and George W. Bush fell over himself to officially recognize and extend diplomatic relations to that fake country … seriously Bush did as much or more to advance the domestic and global Muslim agenda as Obama can hope to). Folks who do not adhere to Zionist interpretations of the Jewish scriptures and believe that the Jews are just another in a long line of people to lose their land (or in this case some of their land) are going to use long-standing United Nations resolutions as their guide to this conflict, and calling them anti-Semitic for failing to believe in the Jewish religion or for elevating the land claims of the Jewish people over that of, say, the Kurds isn’t going to yield desired results. Allen West spoke a lot of true words, but that does not change the fact that faith-based foreign policy (to somewhat appropriate a term used by either Caroline Glick or Michael Freund in the Jerusalem Post … I forget which) isn’t going anywhere with people who don’t share that faith. Even the very legitimate issues of the Islamic threat to Israel and the world … only an ideologically committed minority actually believes that the Palestinians and Muslims/Arabs in general will choose or be more inclined to peace once the Palestinians get a state. Instead, the issue is a longstanding U.N framework, as well as agreements that the U.S. brokered and or signed. The idea that the U.S. can either break or walk away from those agreements is pure fantasy. Reagan was able to steer clear of this because of Cold War politics … he had the luxury of backing NATO-aligned Israel against a Muslim world that mostly aligned with the Soviet Union (Iran, Syria, and the PLO). Once the Soviet Union collapsed, the U.S. was stuck with U.N. resolutions and its own brokered/signed agreements. That’s why the George H. W. Bush/Brent Scowcroft/Dennis Ross/Condi Rice team came up with the “roadmap for piece”, and it is why Clinton, George W. Bush, and Obama have all followed it. George W. Bush called the failure to secure the Palestinian state the biggest failure of his presidency, remember? And that’s why whoever replaces Obama will either have to do the same, or come up with his own version of the Scowcroft plan that implements U.N. resolutions and the agreements that the U.S. signed/brokered between Israel, the PLO, Egypt, Jordan etc. Sorry, but calling Obama a Muslim, a Jew hater, an Israel hater etc. doesn’t deal with these realities that aren’t going to change no matter who the president is. If you want a different Israel policy (again no matter who the president) you are going to have to change the groundwork. Talk about how we are going to terminate the previous agreements that the U.S. signed, and get the U.N. to rescind nearly 70 years of resolutions. I am not saying that it is impossible, but it will come at a heavy, heavy political, economic and possibly military price. No major politician has outlined the costs of doing so and advocated that we be willing to pay it, and this includes West, Mike Huckabee (who advocates wholesale relocation of the Palestinians to their own state elsewhere), Reagan (who again avoided a long term position or strategy on this issue apart from the context of the Cold War) … you name it. And until someone actually does, it is only so much hot air. Allen West will appeal to Evangelical Christians first and foremost. He will appeal to Jews who despise obama (cannot capitalize his name) and there are many. I am sure there will be many more before 2012. He will appeal to just about every non muslim in the US who feels that islam is extremely dangerous to Judeo/Christian values and quite frankly, that might be the largest voting block at a time like this. Allen West will also appeal to a lot of black people who know they were duped in 2008. Quite frankly….Allen West will appeal to people who are tired of lies and like to hear the truth. Didn’t Caliph Umar proclaim the land that is considered Palestine the land where the Jewish tribes of the Arabian Peninsula were to relocate to as well, based in no little part than the fact that it had been previously established? Been awhile Gerald good to hear from you! Nobody gets it. Obama is inciting all the muslim youth to overthrow their regimes and eliminate Israel. He wants to get out in front of that parade and turn it into a global referendum in support of His international leadership, he wants to be ruler of the world. We need to impeach Obama. Two words: Operation Samson. The Arabs had better be careful. great laugh! who knows what lays beyond this curve? We could well see two black people running for President in 2011. The chicken is coming home to roost. The West needs Allen West!!! If you’re going to confront Muslims and get ’em angry, do it right. Allen West did it right. Barak O’Bama did it wrong. Conventional wisdom says Barak O’Bama angered Israel and it’s supporters with his comments. What is not realized by anti-Semites is that he merely scapgoated Israel while further angering Muslims. The President’s speech did nothing tangible to move the parties toward agreement and he knows it. Americans know this is not true. Even the Muslims know it isn’t true. The President is trying to fool the American public. Fortunately, we still have leaders like Allen West who will articulate the obvious and put the President on notice that most Americans aren’t buying it. Who established hanmas in the first place? The Jordanians in Palestine are ancient history and what do the Golan Heights have to do with Palestine? (There is no way the Jordanians are going to come back and keep Jewish people from visiting the western wall of Herod’s building and the Israeli government needs to talk to Syria about the G. H.)I agree it will be hard on Israel to lose its army training grounds which are the west bank. Yes, we are all sons of God but not Judah. Maybe we used to be Jewish as in religion but some of us decided to choose a different religion like Christianity. Good question about american tax $ although very few people want a rdical Islamic state. (Every country has extremist. You can’t lable all of us because of a few.) The palestinian leadership is merely a hand puppet for Israel and probably told the PA to talk up Hamas so people like you would write egregious responses like you wrote. Very few people would admit their ultimate goal is to eliminate Israel and the Jewish people sort of like saying all americans want to eliminate Khadafi or they all wanted to eliminate Bin Laden or Saddam. I think what Hamas is saying is that the palestinian refugees have a right to return and or equivalent value for their stolen property and that there should be equal justice for all people living in what ever you want to name it but a space on earth where I have citizenship and my passport says palestine. Christina, FYI…Christianity is a sect of Judaism…not a “different religion”. Well I don’t care, I want this man to run for a president!!!!!! I will vote for him and all my family will. I also know about 50 more people (Russian Jews) that will join me. Living in USSR we learned a few things and we can tell a real thing from fake… And it has NOTHING to do with the color of his skin! West understands more about the danger of Islam than any other front runner for the election, though I wish his assertion that Israel is the US’s “strongest ally” would be backed up with action – you know, like the Brits, helping out in Iraq and Afghanistan, for example – and don’t let inconvenient facts like the USS Liberty spoil your illusions. Israel looks out for Israel, period. West is a real American. Put aside the anti-Obama rhetoric for a moment, please. What Obama stated was the same thing that Bush and Clinton have stated: land swaps based on ’67 borders. Now if you look at a map, you will see Gaza separated from West Bank. That means there can be no contiguous Palestinian state without re-working borders. Obama also preempted the Abbas dream of the UN declaring a state, by saying we would not support this because of Hamas and non-recognition of Israel. Nothing then very new in what Obama has said and yet lots of screaming about Obama being anti-Israel. As far as a state: we have a zillion Palestinians in occupied territory and just about all Israeli, other than the fringes on the far right, agree that there needs to be a two-state solution and with it, an end to hostilities. So before venting so much, recall that Obama merely saying what Bush and Clinton et al, including previous PM of Israel have stated about beginning negotiations at the 1967 borders. That is but the beginning. But a beginning is needed. I mean really Alan, I thought Roman Emperors ceased to have authority over the region a long time ago, so while what you say may be historically accurate it has very little relevance to what is happening there today. If the argument that “just because you weren’t a recognized people or nation 2000 years ago, you have no right to be here now” is valid, well, let’s just say that a lot of Americans have some soul searching to do. I mean what, do we all need to now move back to whatever region our ancestors lived in 2000 years ago? Because that’s the only legitimate place we can call home? Applying this logic to just one group of people selectively is just simply not fair. Palestinians are people and Isrealis are people and PEOPLE suffer on both sides of this conflict. If Alan West has something meaningful to say about finding a way to end that suffering, rather than just try to delegitimize one side or the other then I could agree that he said something “fantastic”. I would love to see a ticket with Herman Cain and Allen West. This would completely negate the racist card that gets played by the liberals and media – “you only wont vote/support/like/agree with BHO because you’re a racist” garbage. This would then return the election to being about ideals, experience, and leadership ability and nothing else. I also hate to see the treatment Mr West gets over his incident with the prisoner while he was in the US Army. Clearly he got the shaft over it and should have gotten a medal and promotion. War requires dramatic, decisive, and often unpleasant actions to defeat the enemy, a fact that seems lost on today’s media and pols. If they had covered / controlled WW2 the same way our military is today, then Hitler and Tojo would still be in charge. Debbie AW is getting lots of naches from the the legitimate Jewish outlets here. Last week he spoke at Chabad HQ. Meanwhile the busted Reform type rabbis are embarrassed about him. I love this man. He’s my Congressman. I voted for him, and will again, and again. I would love to see him in the Oval. As Always, Anyone But Obama 2012! Every one is proud of him. He is not afraid to fight back on all the damage Washington is doing to our country and all the propaganda coming from them also. The best thing the people in your State can do before it is to late, and it almost now, is get together and let him know you want him to run for president NOW. I believe he could easily win. The reason he gave for not running 2012 is he promised those who voted for him to go to Washington and fight for our country and people. He wants to keep that promise for his term they sent him for.. The 2016 run he did not rule out. We won’t have much of a country left by then. Get all the signitures you can from your state letting him know he would be a valuable President and want him to run 2012. Never to late for him to get in the race and win.